Yay, last week my niece was 6 years old and I got to bake her a birthday cake. My mission was to bring the seaside to Shropshire. I'd been planning the cake for a little while, I'd bought some shell moulds and lustre dust from the Telford Sugarcraft Show back in May. 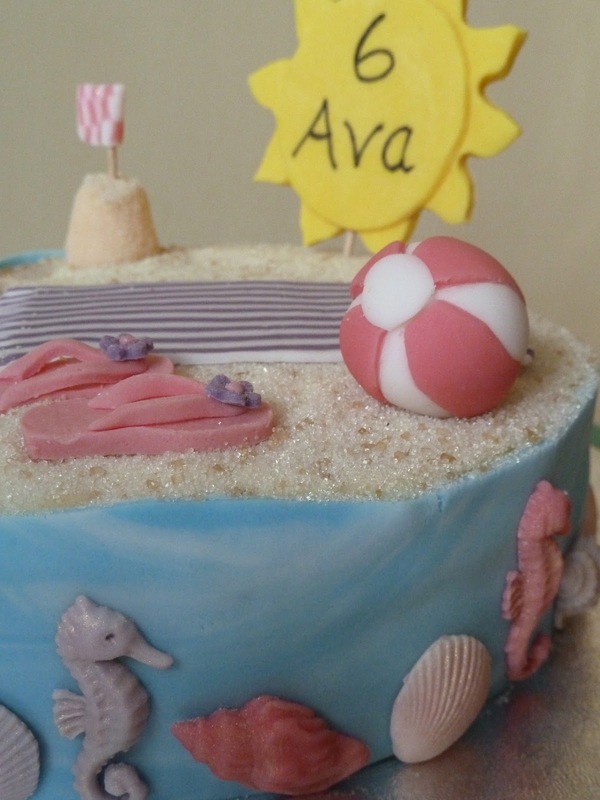 The Seaside Cake consisted of a vanilla sponge, with jam and butter cream. I only applied the sugar paste sea to the side of the cake and golden caster sugar on the top to give the sand affect. Here are the details on how I achieved the other decorations on the cake. Sea - to get the sea effect I kneaded a ball of blue sugar paste and ball of white sugar paste together, then rolled out and got this great mixed water effect. Beach towel and sandcastle flag - this stripey and checker board effect was created by placing tiny pieces of different coloured sugar pastes onto a rolled out piece of white sugar paste. I'd seen this demonstrated by Kathryn Kelly at the Telford Sugarcraft Show. It's a little time consuming and tricky but looks great. Flip flops, bucket and spade - these were made free hand using a craft knife and a paper template I'd created. I used a tiny blossom butter for the flower on the top. Shells and Seahorse's - created with sugar paste using the Seahorse & shells mould I bought from the FPC Sugarcraft stand at the Telford Sugar Craft Guild Show. Though they do recommend you use a mixture of flower paste and sugar paste, I only used sugar paste, with no problems. Once dried a applied the lustre dust for colour and sparkle. Sun - I used a large round cutter, then using a craft knife cut out the shapes to give the sun it's rays, and moulded by hand to soften up the edges. Whilst still pliable insert a cocktail stick half way in. Once dried I wrote on it using an edible ink pen. There you have it my Seaside Cake. The children are going to LOVE that cake. It is wonderful! It is a beuatiful cake, looks too good to eat.